With Valentine’s Day upon us, it’s time to tackle the oh-so-romantic topic of divorce. Once couples make it through the holidays, the first few months of each year typically see a surge in divorce filings. Those can be particularly detrimental to a woman’s financial health. Even women with significant assets often suffer financially during and after a split, says Stacy Francis, a New York-based CFP and Certified Divorce Financial Analyst (CDFA). Francis recently conducted a study of more than 150 women in various stages of divorce and found that in this scenario–like many others–the best defense is a good offense. 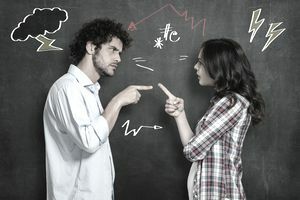 The challenge, she explains, is that “individuals in a divorce are forced to make major life decisions within a finite period of time.” That can lead to rash thinking, and often mistakes. Going in with a clear head, a realistic sense of your resources and an idea of what you want coming out the other side is key. Take Stock of What You Own—and Owe: It may sound tedious, but you need a clear and certain reckoning of precisely what your assets and liabilities are. If you’ve ceded financial control during your marriage, taking the time to gain this knowledge can also help level the playing field; Francis notes that the spouse who has been driving the bus has an advantage over one who has not. Specifically, you want recent bank and brokerage account statements (for both retirement and non retirement accounts); pension and Social Security statements; deeds for properties; mortgage, auto loan, and credit card statements, as well as those for other debts like 401(k) or personal loans; and the last three years of tax returns at a minimum (five to seven if you own a business). These may not all be documents with which you feel familiar. According to Francis’ study, while more than three-quarters of women either paid the bills themselves or shared the chore with their spouses, only about one-third felt comfortable managing their investments. Look Closely at Your Spending: Next, try to understand how much your current life has been costing you, says Lili Vasileff, a CDFA, and author of the new book Money and Divorce. How many of those expenses are fixed, as opposed to discretionary? Are they yours, his, or the kids’? It’s important to get granular here. If you or your spouse had a business and you ran personal expenses through it (perhaps the business leased your car, or paid for meals out with clients), you may not be able to do that anymore, and that may result in paying more in taxes. Think Long-Term: Vasileff says that one of the most important things you can do–even before you speak to a lawyer–is to think about the outcome you want from this process. What would life look like five or 10 years down the road, if you could plot it out? Is maintaining your current lifestyle the priority, or are you more focused on feeling secure? Those decisions will be helpful in driving the specific assets you go after in your negotiation. Some 15 percent of the women in Francis’ study wished they had come through the process with a different asset agreement. Often the mistake women make is fighting for a house they really can’t afford to keep. (If you come to this realization shortly after divorce and sell at that point, taxes may make it impossible to pocket substantial gains). Mistakes are also made with investment accounts, which may have similar face dollar values but very different after-tax ones. Get Financial Help: When you’re in the initial stages of divorce, friends will come out of the woodwork to recommend their attorneys. Really good friends will turn you on to their financial pros. “The minute you’re divorced, when you walk out the door, and your attorney says goodbye, it hits you,” says Vasileff. Now you have to not only make sure all the assets are transferred to you correctly, but you also have to create a new financial life. It means figuring out a new budget, setting new savings goals, and reinvesting whatever you receive as part of your settlement, based on your age and individual risk tolerance. That’s when having a financial planner on speed dial comes in particularly handy.